Think you know? Did anyone figure it out? Read on to discover the answer! Moira: Those long thin balloons that clowns make into animals, but deflated and rolled down over themselves into doughnut shapes. Maple girl: Pool floaties for fairies? Rae: Hemorrhoid rings for fairies! Saraccino: Alien worm eggs, for sure. Amy: Green Lantern's pinky ring. Meijo's JOY: A brand new wasabi-flavored cereal. Brilliant guesses all. If only! It might make you queasy. 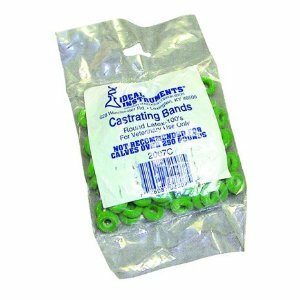 Castrator bands, for removing the unwanted dangly bits of various livestock. I know: waaaah! But at the feed store where I found them, I was assured it's a relatively humane way to go about the job. I'd have been nuts* not to turn them into a Mystery Thing. Winners? Yes, indeed! The brilliant Ashley (who lives on a farm) was first to enter a correct answer - yay, Ashley! Now if only your parents will be okay with you wearing jewelry made from such a thing...if not, I shall send you something completely unrelated but equally cute. And my random.org winner: jillshope. Congratulations to you both! Thanks for playing, all you groovy people. You always make my week! See you again soon. OMG! Not recommended for calves over 250 pounds. Ouch!! Ahahaha!!! Nuts. *giggles for a good 5 minutes* Interesting items aside, I like the necklace. It's cute. And no one really has to know. But you'll know. This has to be your best yet Mich! How can you possibly go crazier than this?? And I thought Ashley, Lisbonlioness, and Elizabeth were joking..but then I didn't see them on the HONOR ROLL, UH OH..can you be serious?? Where's the nearest feed store here on the East Coast? So cute..but CRAZY..I'm with Lisbonlioness, hope doggy is hiding. This is the craziest upcycle yet. I remember those from when I was a kid - we raised sheep and we used them both for castrating purposes and for removing the tails of lambs. I wouldn't have guessed - of course childhood was a really, really, really long time ago. Please don't answer that, fairies or not. Went through all the Mystery Thing posts recently to put my guessing skills to the test...can't believe I missed this one!! LOVE it! A while back I was searching and searching for inexpensive latex rings to use in my chainmaille jewlery. Little did I know that all I needed to do was visit my local feed store for some of these rid-o-ball bands!! LMFAO! !